A soufflé is such a beautiful and sophisticated dish. It is delicate, light, and airy, like a puffy cloud. I must admit, though, that the idea of making a soufflé was very intimidating to me. I tend to focus on the things that could go wrong – it wouldn’t rise, it would fall flat midway through cooking, or it would be lopsided. However, I came across the following tips for making the perfect soufflé and it gave me the push I needed to give it a try. A soufflé is customarily baked in a tall, round, fluted dish with straight sides to promote rising. Soufflé dishes must be prepared with a coating that helps the batter rise. 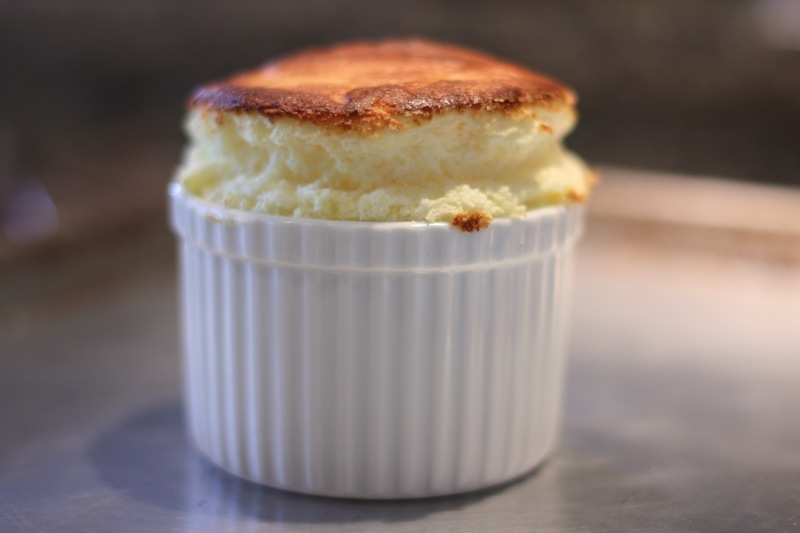 By coating the inside of a soufflé dish first with butter and then with a dusting of sugar, the batter doesn’t adhere to the side of the dish, thus leaving it free to climb to the top. Once prepared, place the dishes in the refrigerator until ready to fill. Very fresh egg whites have a high water content so they are prone to graining and do not hold air as well. It is best to use eggs that are 4 or 5 days old. When whisking the egg whites, it’s essential that there not be a single bit of egg yolk in the whites because it will interfere with getting the necessary volume. Also, make sure the mixing bowl is meticulously clean, with absolutely no residue to ensure that the egg whites whip properly. Be certain that the soufflé base is cooled to room temperature or close before folding it into the egg whites because a base that is too warm will deflate egg whites. To help the soufflé to rise evenly, run your thumb along the outer edge of the dish, about a half inch deep or so, before you bake. A collar adds stability to the soufflé if there is concern about too much height or being lopsided. Take a piece of parchment paper long enough to wrap all the way around your dish, fold it in half lengthwise so it is stiffer, and tie it around the outside of the dish with bakers twine so it rises about two inches above the rim. Cook souffles at the bottom of the oven if you use traditional (nonconvection) baking, in the middle if you use convection bake. Don’t overcook the soufflé because it will become dry and will collapse more easily. Start testing it a couple of minutes before the recipe says it will be done: very gently shake the baking dish to look for jiggling — don’t worry, this won’t cause the soufflé to fall. I am so glad I made these soufflés. They were surprisingly easy to make and they came out perfectly. Once the soufflés start to cool, they do deflate fairly fast. By the time they came out of the oven and I got a photo of one of them, they had deflated by at least an inch. However, even with the soufflés being a little flatter, they were still pretty and they tasted great, too! In spite the bold color contrast, the combination of lemons and blackberries pair very well together. 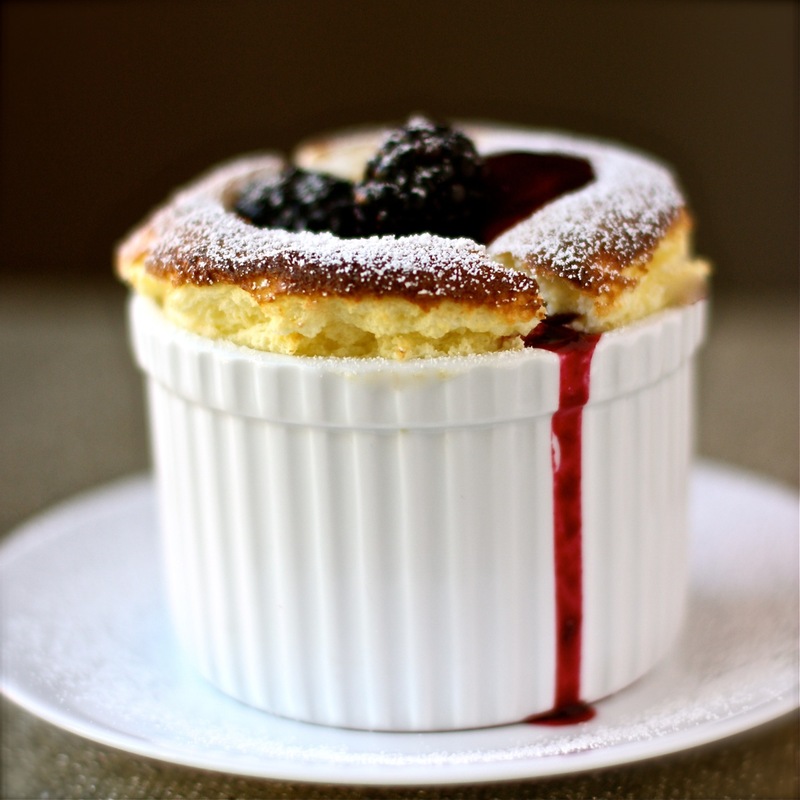 The light and slightly tart lemon soufflé pairs well with the rich and sweet blackberry sauce. This is an adaptation of another Sherry Yard recipe from her book, The Secrets of Baking: Simple Techniques for Sophisticated Desserts. For the base of the soufflé, stiffly whipped egg whites are gently folded into lemon curd. I placed a few blackberries on the bottom of the ramekin before carefully spooning in the soufflé batter for a warm, jam-like blackberry surprise. This is the last recipe in the Meyer Lemon series. I hope I gave you some inspiration for using these great little lemons. Preheat oven to 400 degrees. Adjust the rack to the lower third of the oven. To prepare the baking dishes, brush ramekins or soufflé dish with melted butter and lightly and completely coat with sugar. Set aside in the refrigerator until ready to fill. 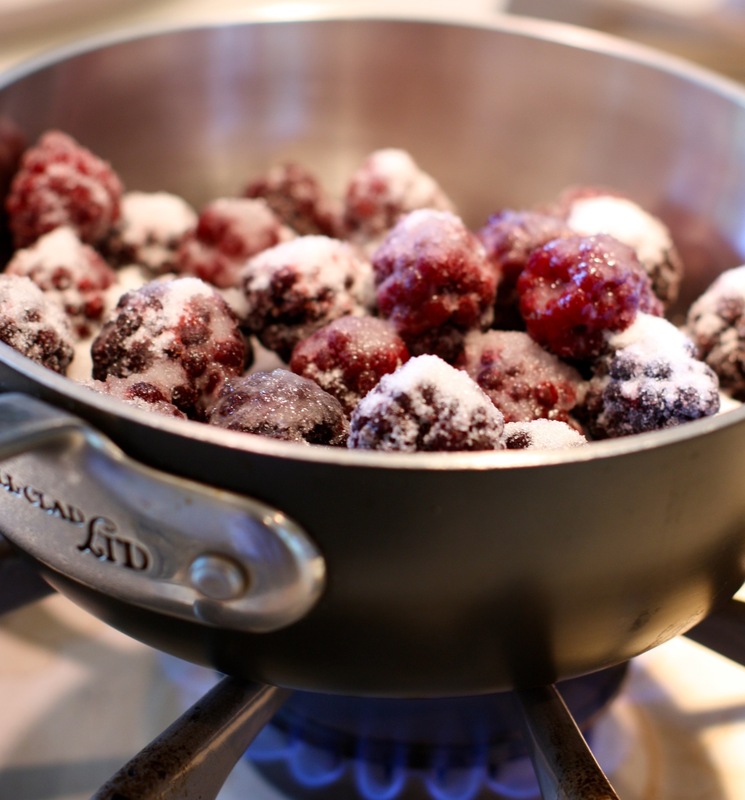 To prepare the sauce, cook blackberries, sugar, and merlot until fruit is soft and breaking apart. Strain through sieve. Add squeeze of lemon juice. Cool before serving. To prepare the soufflé, combine the lemon curd and lemon juice in a large bowl. Set aside. Using a standing mixer fitted with the whisk attachment or a hand mixer, whip the egg whites on medium speed until a soft foam appears, about 30 seconds. Stop the machine and add the cream of tartar. Continue to whip to the soft-peak stage, about another minute. Gradually sprinkle the sugar, while continuing to whisk. Whip until the egg whites are at the stiff-peak stage, about 2-3 minutes. Using a rubber spatula, carefully fold in the egg whites into the lemon curd, one third at a time. 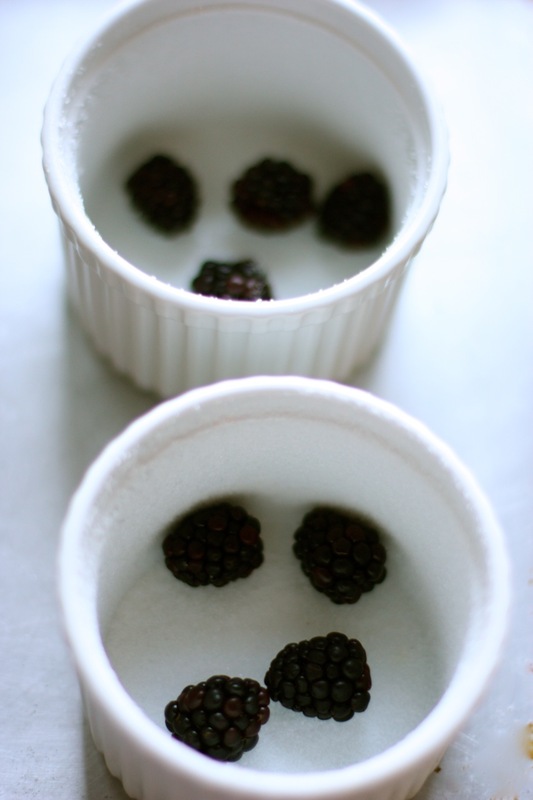 Place 3-4 blackberries on the bottom of each ramekin. Spoon the soufflé batter into the prepared dishes. Pile it up, no more than 3 inches above the rim. Add a collar, if necessary, to keep the batter stable. Place the soufflés on a baking sheet and bake for about 12 minutes, or until they are tall and golden brown. They blackberries on the bottom should be warmed through and the soufflés should be pudding-like and a little creamy in the center. Dust the tops of the soufflés with powdered sugar and drizzle the blackberry sauce. Top with fresh blackberries. Hello. I googled lemon soufflé and found many recipes. None had real users reviews having tried the recipe, so I went for your recipe with good reviews.I was also always daunted by soufflés after having tasted one once in a restaurant many years ago. Your recipe uses lemon curd ( I used one from a jar instead of making from scratch ) which greatly simplifies other recipes where you have to make a custard yourself. Also other recipes require placing the ramekins in a water tray in the oven Whereas your recipe just says a baking tray.. Anyway, I just wanted to tell you that I am by no means an accomplished cook, quite the contrary, but I followed your recipe step by step. I used a thick, cookie baking tray the kind that are air-hollow, and the results were sooooo good and sooo pretty!!!! I used ramekins twice the size of yours, so i had to increase the oven time a little, but still perfect. My only mistake was to place in the oven at the time of sitting down for our main course and they were done too early for dessert, but i took them to the table to show my family when they were just perfect… Then i put them back in the oven ( turned off ) to wait about 10 minutes till the main course was finished and they were fine and did not sink too much. So just a big thank you from a complete beginner. I feel confident enough to try this for guests next time. Any tips on which parts of the recipe can be prepared a head of time? Also one more thing, i think i should have smoothed the top of the ramekins with a spatula because the tops of my soufflés came out a little uneven. Hi, Roxi from London! Thanks for taking the time to let me know how much you liked my recipe adaptation. Did you use a collar, meaning did you wrap a piece of parchment paper around the ramekin to encourage the souffle to puff straight out and even? That would do the trick. You can make the lemon curd and the blackberry sauce ahead of time. The souffle batter can’t really be made too much ahead of time, maybe a couple of hours ahead at most, because the egg whites will deflate and become grainy. You really want to make it close to serving time. Now that you’ve made them once, you’ll be able to judge when you need to put them in so they’re ready when you’d like them. These pictures are absolutely GORGEOUS. Hopefully I’ll get to try this in the future 🙂 Thank you!! My husband made this recipe last night and the souffle turned out divine! I highly recommend it. He did substitute the blackberries for strawberries, as that’s what we had a little excess of. Thanks for sharing this! Thanks for letting me know, Marina! I hope your husband found it easy to make. It is amazing how intimidated I was to make this, but it turned out sensational. Any berry works well with this. BTW, I love your photos of NYC. He just told me that the recipe was surprisingly easy – and it was his first attempt at a souffle. I took some photos and can share them with you if you’d like! Thanks for your lovely comment about my photos – NY is pretty inspiring! Yes, please share photos. I love to see how others interpret recipes, plate the dish, etc. I agree, NY is inspiring. I try to visit every chance I get, and every time I discover something new and wonderful. It is so rich in history. I took the LES Tenement Tour the last time I was there and it was a wonderful glimpse of that history that makes NY great. You’ve inspired me to wander around and look at Los Angeles, with my camera, in the same way you do NY. Hi Daisy! Let me know what email address I can send the pics to! Hi daisy! To follow up re: the elft over batter – after a few days, it had liquefied. So best to use on the day, or maybe one after?!! Pingback: מתכונים שנראים טעימים | סופלה לימון ברוטב פטל שחור ומזל טוב לי! First of all: YUM! This flavour combination is one of my favourites. Second: hats off to you for a beautiful souffle. I just made my first souffle a couple of years ago and it has been an exciting and challenging process learning how to tweak and improve them. Third: the tips on making a souffle are spot-on. I so appreciate recipe posts that troubleshoot difficult dishes for readers who might otherwise be intimidated. Fourth: what a gorgeous set of photos! Absolutely arresting! Beautiful! Oh.. I’d be afraid to touch it – it’s so beautiful! Wow this soufle is so beautiful! Must be a great combination of flavors. Thanks for a great recipe. When I gather courage, I will try! I really encourage you to try. It is surprisingly easy, and I felt like a wimp for not trying sooner. Let me know how it turns out. Hats of to you. I have a huge fear of making souffle… Every year I want to make it for my Hubs and every year I chicken out.. Your souffle is so grand and beautiful! Love the flavor combo! Congrats on your success! I’ve passed this delicious looking and sounding recipe to my husband – the chef 🙂 Thanks for sharing! Yum! I’ve never made a souffle, but I would love this one: lemon and blackberry — two of my favorite things, and seasonal if I omit the fresh blackberries. I’ve been loving the lemon recipes. Surely they will return in February when your preserved lemons are ready. It looks like they turned out just perfect! I love your food styling photos.. I’m off to look at the rest of your blog:) Happy to have found you! I’m hoping to try making a souffle one day!